It is well known that Koreans, especially men, are very fond of indulging in aperitifs, since it is beneficial for good health and digestion. For this reason, O'Kim's is now offering a complimentary glass of beer when you order any one of their scrumptious main dishes for lunch. Patrons can now enjoy a beer with one of O'Kims hearty Irish meals and unlimited salad buffet. O'Kim's Happy Event also includes a Happy Hour from 6:00 p.m. ~ 8:00 p.m., during which people can receive a 20 percent discount on a glass of fine whiskey. O'Kim's Happy Hour just may be perfect for unwinding after a long day at work and sharing a drink with your friends or colleagues in a revitalizing atmosphere. For celebratory occasions over the weekend, they are also offering a Saturday Family Party special. 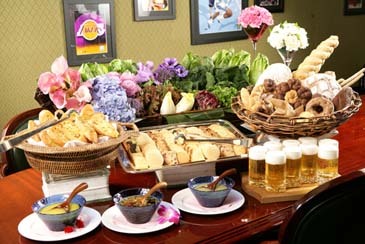 Hold a lunch party for 50 people or more, and O'Kim's will provide free soft drinks for everyone! Whether you want to drop in for a delicious lunch or relax and rejuvenate over happy hours, O'Kim's is the ideal venue to satisfy every indulgence!